In part one of this post we looked at the BBC’s misrepresentation of Israeli building during the period of the recently ended negotiations between Israel and the PLO and the way in which politically motivated reporting steered audiences towards a belief that thousands of new houses and apartments had been constructed in Judea & Samaria and areas of Jerusalem over the ‘green line’ during that time, despite the fact that the actual figures show a different picture. The prime cause of the inaccurate impression received by audiences on this issue is the fact that the BBC refrains from reporting on actual building and instead focuses its (and its audiences’) attentions on requests for building tenders, even though it is a known fact that a considerable proportion of those tenders do not result in one breeze-block being laid or foundations being dug either because no bids are offered by contractors or bids which are made are too low. Neither does the BBC overly trouble itself when it comes to reporting where exactly building tenders are located and whether or not they are in areas which, under any realistic scenario, will remain under Israeli control in the event of a peace agreement. Hence audiences remain oblivious of whether or not the plans cited by the BBC have any actual bearing or significance. Likewise, audiences are not made aware of the fact that no existing agreements between Israel and the PLO (including the Oslo Accords) forbid or curb construction of housing within Jerusalem or Judea & Samaria. 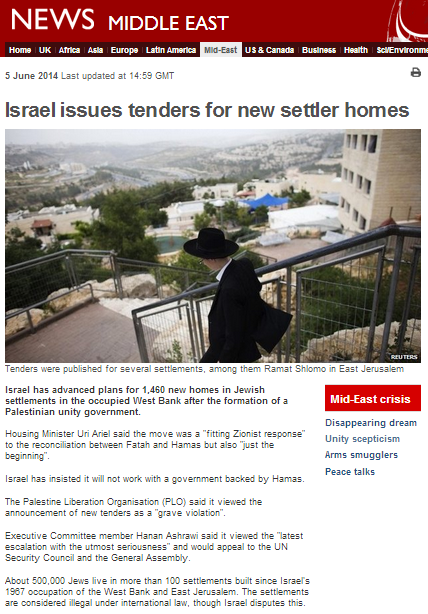 A report which appeared on the BBC News website’s Middle East page on June 5th under the title “Israel issues tenders for new settler homes” is notable for its failure to make many of the above points clear to readers. However, at no point in the article are readers informed that the vast majority of those tenders are located in areas which, under the terms of previous proposals such as the Olmert Plan and the Clinton Parameters, would – in the event of a peace agreement – remain under Israeli control after land swaps. The article does of course include a version of the BBC’s standard problematic insert on the topic of ‘settlements’ which not only breaches editorial guidelines on impartiality by failing to note differing legal interpretations of ‘international law’ besides that of Israel, but also inaccurately informs readers that all the people living in what the BBC terms ‘settlements’ are Jews. This report also includes the amplification of assorted quotations from politically partial sources. “The Palestine Liberation Organisation (PLO) said it viewed the announcement of new tenders as a “grave violation”. A “grave violation” of what precisely is not clarified to audiences. No attempt is made to place that unsubstantiated and outlandish claim from a campaigning organisation repeatedly quoted and promoted by the BBC into its appropriate political context. In contrast to the amplification of context-free political slogans, BBC audiences are not however provided with any proper background information concerning the pressing housing shortage in Israel and its relevance to the topic of this article. This report also breaches BBC editorial guidelines on accuracy by once more misrepresenting Hamas’ terrorist designation. The recent round of negotiations between Israel and the PLO commenced at the end of July 2013 and concluded towards the end of April 2014. As the statistics show, actual construction in Judea & Samaria and Jerusalem as a whole – not just the neighbourhoods described as ‘settlements’ by the BBC – was nowhere near the figures cited and promoted by the BBC throughout that period. 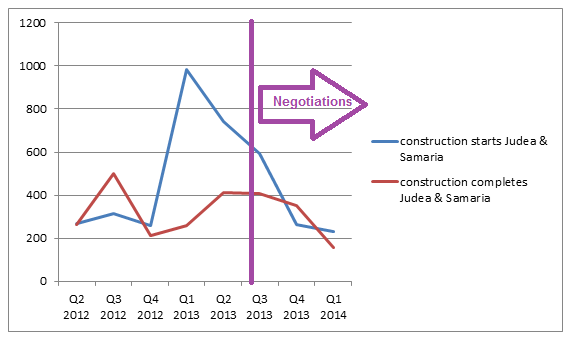 Despite the fact that no limitations were placed on construction in the preliminary agreements which came as precursors to those talks (the PLO of course opted for prisoner releases instead), we see that between the end of July 2013 and the end of March 2014, actual construction starts and completes fell in Judea & Samaria. BBC audiences will of course not be aware of that fact because the reporting they receive on this topic is uniformly designed to promote a misleading political message and hence airbrushes out the real statistics, thereby actively preventing audiences from reaching their own conclusions based on factual information. “inaccurate and misleading” – or in English, antisemitic lies. Israel is not “building homes” in the Palestinian territory. 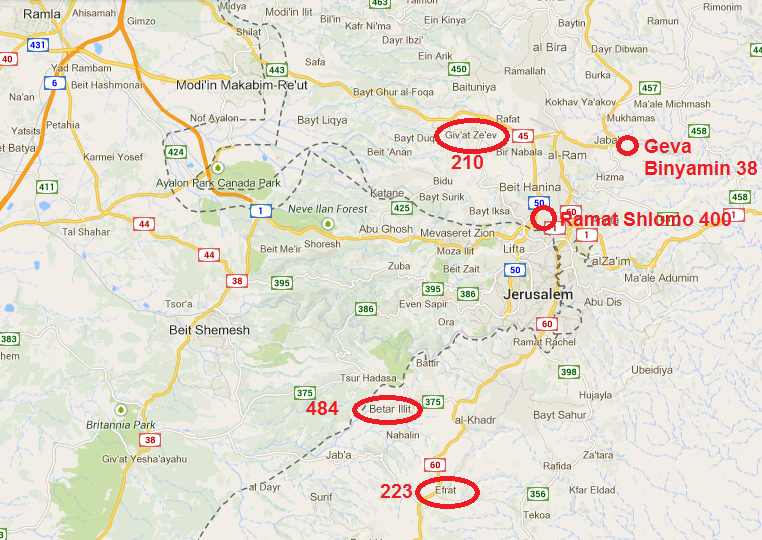 It is building illegal settlements. They are homes, and they are not illegal. Oh, and the territory is not “Palestinian”, nor has it ever been. Otherwise, spot on!